Most Salar de Uyuni tours begin in the small city of Uyuni itself. It is located in the Department of Potosi, in Southwestern Bolivia. It’s approximately 300 Km from the city of Oruro and is located at 3670 meters above sea level. The town has about 15,000 inhabitants. Here are some of the attractions you can see during your trip to Uyuni. Use the links above and below to find hotels, tourist information, and more. The salt flats are, of course, the main attraction of all Salar de Uyuni tours. Over 60,000 visitors arrive in Uyuni each year. This is the largest salt desert in the world and covers over 12,000 square kilometer. The salt is over 120 meters deep. It is surrounded by volcanoes and is a very remote, arid, and cold region. Read more interesting facts about this region on our Salar de Uyuni Home Page. 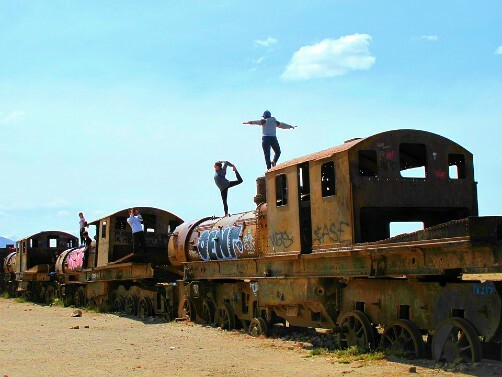 Uyuni used to be an important train station during colonial times. It still has a train station but of course with newer trains (although the trains are not running at this time because the government nationalized the train company and has not yet organized a new company to operate the railway). The old steam engines and some of their cars were abandoned about 3 kilometers from town and for some reason they’ve become a really popular tourist attraction. Almost all Uyuni tours include this. At about 5000 meters above sea level on the way to Laguna Verde, is a place with very strange rock formations shaped by wind erosion. Some are shaped like animals. About 100 Km from Laguna Colorada is this smaller lagoon. Its waters are turquoise to green due to the lead, magnesium, sulfur, and arsenic they contain. 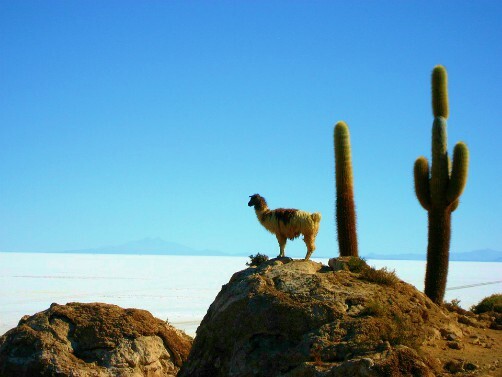 It’s a beautiful sight and also commonly included in Uyuni tours! At 4278 meters above sea level, this is the largest lagoon in the area. This is the best place to watch flamingos. The lagoon is a dark rusty red due to the algae and mineral sediments in the water. There are hot springs and salt beds nearby. It’s a popular stop on most Uyuni tours. 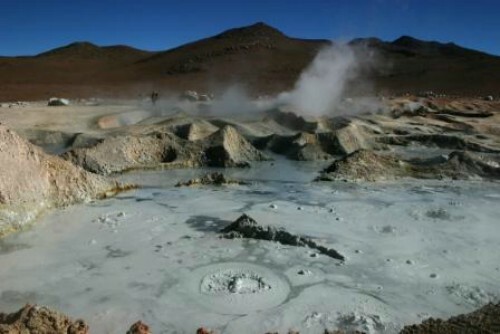 About 50 Km from Laguna Colorada and at a mind-blowing 5000 meters above sea level, you can see the mud baths, fumaroles and geysers that emit sulfuric gases that smell like eggs. Sometimes the geysers spout hundreds of feet into the air! This enormous lagoon has little hot springs all around it. Locals claim they are curative and heal arthritis and rheumatism. Located near Chalviri. This is a little town about 22 kilometers from Uyuni where salt is extracted from the Uyuni salt at the rate of about 25,000 tons per year. They process almost all of the salt as table salt and some is exported. This is an island located in the center of the salar, about 100 miles from Uyuni. It’s filled with huge cacti that grow up to 40 feet tall. Some of them have numerous branches. It’s a great place for photos. This is a sub-aquatic cave formed prior to the formation of the glaciers when volcanic eruptions took place when the lake that used to cover the Salar still existed. Inside you can see calcified shapes of magma that solidified as they hit the water. This is located on the way to San Pedro de Quemes. In the same area as the Gruta de la Galaxia, just a few meters from the cave, you can visit this “Devil’s Cave” with Pre-Colombian constructions inside. There are several tourist attractions in this area including the Irupuntuku Volcano, the Empexa hot springs, and the town itself. This is a little town about 80 miles form Uyuni. There’s a really nice hotel here. Located at the foot of the Thunapa hillside, this town is an archeological site where you can see some of the history of the Aymara peoples. This town is about 5 miles from Tahua and an astronomical observatory is being built here near the Thunupa mountain more than 4000 meters above sea level. There’s a cave here with Aymara mummies. A Pre-Incain fortress with small windows in its walls for overlooking the area and watching against attacks by enemies. It is believed this fortress was built to house and protect an ancient food storage site. This is where the famous "Árbol de Piedra" (Stone Tree) is located. It’s about 20 Km North of the Laguna Colorada. There are other wind-eroded rock formations here too and some are formed by petrified lava. This salt flat is located in the Eduardo Avaroa Reserve. It’s 1000 Km2 in size. A mining company operates inside, extracting borax, additives for fertilizers, and glass. This Volcano rises over Laguna Verde. At the top, inside the crater, there is another lake of the same turquoise color. Currently NASA is studying this volcano because its geological, biological and mesothermic characteristics are similar to those of Mars.